It started at Christmas. We bought Norton a Melissa and Doug wooden railway set. It was a small wooden railway set: just a circle with a bland flat engine and a couple of cars that had an elephant and a tiger in them. We also picked up a Skarloey train from the Thomas and Friends Wooden Railway and a tunnel to go along with it. That was the beginning of our wooden railway hobby. We realized that the wooden train track was a great way to go for our family. Wooden train track is durable: it can easily survive the beating that a preschooler and a young toddler will put it through. There are unlimited options: you can buy huge track packs or individual pieces. We also found that loose track pieces were a great reward for Norton. When we’d catch him doing good, we’d reward him with a new piece of track. Not to mention the train track was a great bonding experience. Every day, I’d get up in the morning and I’d build Norton a new track layout. At the end of the day, I’d take the track down and put it away while he showered. I’d have it all put away and his room vacuumed before he was finished. And the husband and I both took great delight in buying new fun bits for Norton’s train set. The husband once surprised Norton with a viaduct bridge. For his birthday, we got the Chuggington Wooden Railway Double Decker Wheelhouse. When we had a successful outing in underwear, Norton and I stopped at the local toy store and got him a Spencer train. I’m not sure who had more fun with the new track designs every day. Me building them or Norton playing with them. Now, though, the amount of track that we have has gotten to the point of doing a new layout once a week. 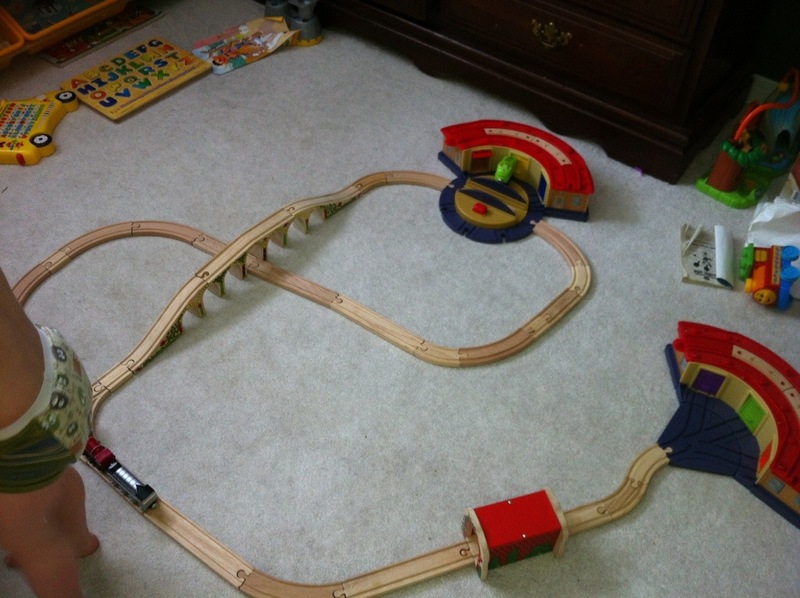 Do you play trains with your kids? What kind of layouts do you like to do?